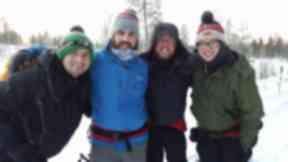 The group battled against freezing temperatures to raise £120,000 for charity. Arctic trek: 'Emotional' journey for parents who lost children. 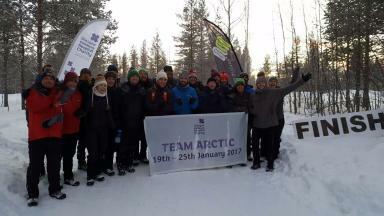 A team of adventurous Scots battled biting temperatures in a trek across the Arctic Circle in an effort to raise funds for sick children. The 17 men and woman completed an arduous 100km hike across the wintry north of Finland, raising £120,000 for Glasgow Children's Hospital Charity. 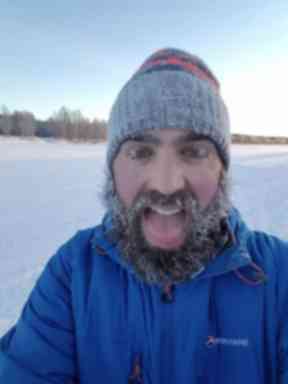 Temperatures sunk below -30C during the three-day trip, where exposed skin and hair was instantly frozen in the glacial climate. Kieran Mackenzie: Intrepid fundraiser from East Renfrewshire. The simple task of fastening a zip became strenuous, while walking through hours of darkness dampened even the most resilient spirits in the bunch. But walkers were inspired by parents taking part who had lost children to terminal illnesses. Kieran Mackenzie, an insurance consultant from Neilston, East Renfrewshire, said the tragic losses were "at the forefront of all of our minds" throughout the challenge. The 26-year-old said: "We met before the trek and a couple of parents told us their story of losing their children only a couple of years ago. "Hearing that and hearing the work the charity does, you realise how much this sort of challenge actually mean to families in Scotland. "There were points where the challenge got to people, but having support from the group and remembering exactly what you're doing it for does help you to keep putting one foot in front of another." 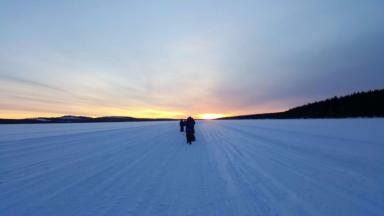 Setting sun: The group trekked through hours of darkness. 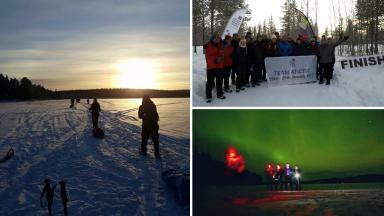 The group set off from Rovaniemi into the Arctic Circle, often trekking through hours of darkness with only lights in the distance as their guide. An unexpected sighting of the Northern Lights at Lake Sinettajarvi boosted morale after the first draining day, where some sacrificed the warmth of their sleeping bags to capture the spectacular phenomenon. The expedition was organised and led by Breaking Strain Events, who trained participants ahead of the trek. Jack Jordan, an accountant from Barrhead, East Renfrewshire, admits elements of the walk were "tough to deal with mentally". The 26-year-old said: "Trying to sleep in temperatures between -20C and -30C was near impossible. But the team of people we were doing it with got us through. "People were there for a variety of reasons but with one common goal - to raise as much as we could for a fantastic charity. 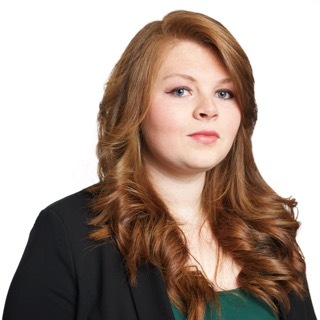 "The last couple of hours on the first day was so tough. One minute you could be giving out words of encouragement and the next you'd need them." 'Camaraderie': Jack Jordan, right, helped boost morale. Sponsorship funds continue to pour in for the group and will be used to fund a number of projects at the Royal Hospital for Children in Glasgow. This includes the establishment of Scotland's first office for rare conditions, which aims to improve the knowledge and treatment of a wide range of ailments. Kirsten Sinclair, director of fundraising at Glasgow Children's Hospital Charity, said: "We are incredibly proud of all our trekkers for successfully completing this extreme challenge in support of our young patients. "This was a massive undertaking but their commitment to training and raising funds has been truly outstanding. "Thanks to their efforts, we will be able to fund a number of projects at the hospital to ensure that patients and their families have the best possible care and experience." Finish line: Thousands raised for sick children.